White tattoo ink may not be the most used color you’ll use. Typically, it’s a color you may reach for to add highlights. But when applied correctly, the best white tattoo ink can make a flat, one-dimensional design look awesome. With white tattoo ink, sometimes less is more. Its best use is for details. How Do White Tattoo Inks Differ from Other Colors? Should You Get a White Tattoo? Mom’s Ink from Millennium Colors, Inc. has a solid reputation in the field as a producer of quality products. So, you know you’re getting something good when you pick up its Power White ink. The company prides itself on producing a consistent product which caught our attention. That message resonates with tattoo artists too. Whether it’s your tattoo machine, pedal, or your inks, you don’t want surprises. Their inks are pre-dispersed and made with homogenized pigments for optimal performance. Most people report a good experience with it. Skin takes the color well with staying power to keep it from fading over time. The product line has many loyal followers that report consistency with all its colors. And that’s the most important thing you need as an artist. For many, it is their go-to brand. Starbrite is another recognized leader in the industry as the brainchild of Tommy Ringwalt, Sr., Mike Nicholson, and Carol Landry. It’s one of the old-timers in the market with over 20 years of experience. The company boasts of sterile tattoo inks that ensure quick healing. The company has a reputation for producing strong, vibrant colors that last. 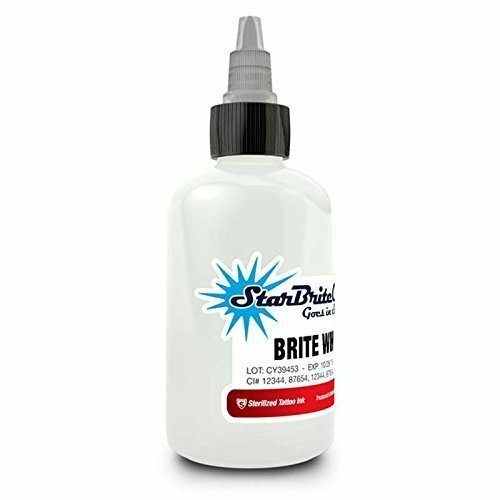 Like most of the brands we considered, Starbrite is USA-based. It promises an authentic product shipped in sterilized bottles. We liked the attention to safety for quality assurance. The white tattoo ink comes with a longer expiration date which may not be a big deal for a product that is only ½ ounces. Users report overall satisfaction with the product. Some report the occasional shipping issue, but that’s hardly a mark against its quality. We’ll give it a pass. 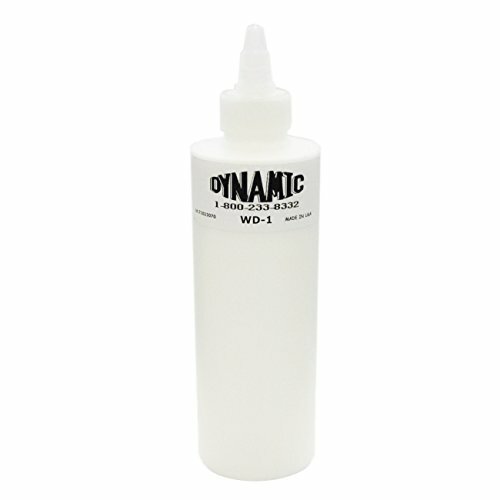 The Dynamic Color Company is also USA-based, offering a similar line of products as the white tattoo inks previously mentioned. They are pre-dispersed pigments that deliver smooth and consistent color that flows easily. And we like products that handle well on the job. This product differs from the others we considered ​with its eight-ounce sized bottle. The other inks we reviewed came in smaller sizes. It’s curious given the company’s recommendation to cut intense colors with white. For consistency, we’d prefer not to mix different color inks. This white tattoo ink was the most expensive. However, it was the most consistent regarding the user experience. It has good saturation for strong color. There were some isolated reports of the product’s fluidity, but there weren’t widespread. Keep it in mind if you have a problem. 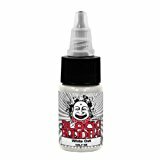 Black Buddha takes its message of consistency and authenticity to the next level that certainly will get some attention from would-be buyers. They produce their products in an FDA-approved laboratory. While the FDA takes a backseat to regulation, we still were impressed. We like the messages of authenticity other manufacturers give. But Black Buddha goes one step further with an anti-fraud hologram, authenticity label on its products. Each bottle has its own serial number. It’s the kind of thing that can make your business stand out. The thing to remember is that your clients are becoming more educated too. They get the risks. That’s why they sought out a professional. Reputation is key for your business. We liked the fact that we could deliver these assurances to our customers. It shows we care too. 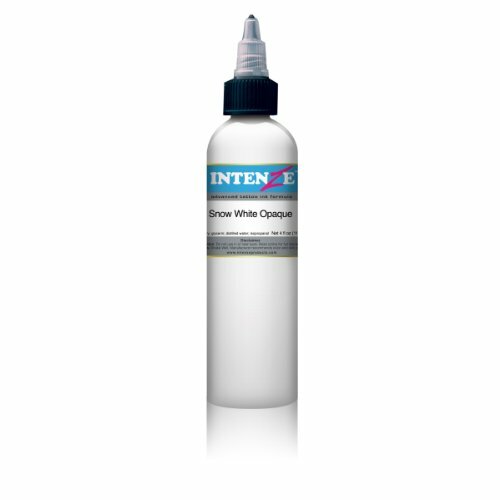 The thing that impresses us the most about the Intenze Tattoo Ink Snow White Opaque ink is the company behind the brand. It scores high marks on several fronts. 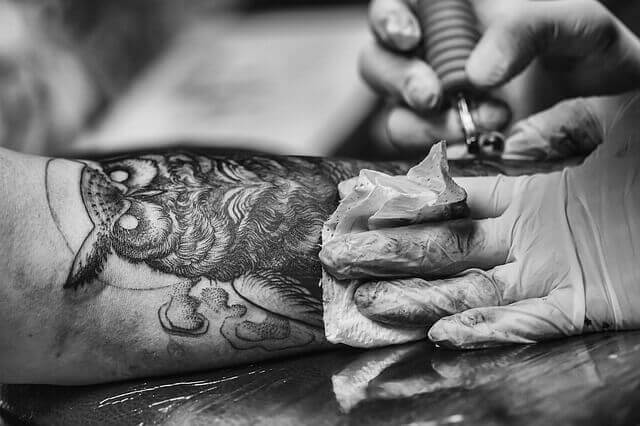 It involves tattoo artists in the process of product development which is huge in our book. We don’t see this enough. The company is also a leader in the tattooing industry with itsIntenze Creative Academy. Here is a business that brings artists into the creative process and encourages professional development. This involvement certainly madeIntenze stand out from other companies. We also liked its attention to safety by having its products tested by a third-party laboratory to makes sure its inks are non-toxic. They don’t have to go these extra lengths; they choose to do it. And we also choose to back a company that puts the tattoo artist first. This caution applies to any ink you buy whether it’s for a stick-and-poke application or a professional job. An underground market has emerged as tattooing has grown in popularity. The stats tell the story. Individuals aged 30 to 39 are more likely to get a tattoo today now than ever. In 2003, about 28 percent had at least one tattoo. The numbers have steadily increased. By 2015, the percentage nearly doubled to 55 percent. The statistics show upticks in all age groups, even senior citizens. And you wondered why Mom didn’t say anything when you got a new one. The scourge of counterfeit inks became evident as we reviewed different products. Almost every product description included some assurance about authenticity. You can’t be too careful as an artist or as a client. The knock-off ink you see cheap online carries serious health risks. You can use white tattoo ink to create negative spaces in an existing full-color too. In that way, it’s not unlike an oil painter adding white over a base coat. While it may seem like a boring hue on its own, it has a lot of power for tying a design together and adding some pop. White tattoo ink also works well for adding highlights to a blocked-in design too. A strategically placed spot of color will make your design come alive. It’ll add a three-dimensional look that can take a plain pattern to the next level. It can also add a bit of realism to your work. A splash of white makes a design appear more lifelike as if it is catching the light. And as you undoubtedly know, it’s the small details that make a tattoo a work of art. It is simply a matter of paying attention to the angle of the light. And that’s one of the best things about using white tattoo inks. Small bits of color go a long way toward making a greater impact. It never fails to surprise us what a big difference a little detail does to a tattoo. Amazing! Just like house paint, white tattoo ink comes in many shades. You’ll find products across the temperature spectrum from cool whites to those with a warmer tone. You may find it useful to try a few different brands to find the shade you like. Only one brand that we considered recommended white tattoo ink as a mixer. Every artist has their preferences. If you use white ink in this way, it’s something else to consider when choosing a product. You may also see products that are vegan and are not tested on animals. If your clientele includes individuals with these concerns, you’ll likely find something that satisfies both your needs and theirs. And most make it very clear if they are USA-made for the same reason. As an artist, you probably follow the trends of the industry. You keep up with the latest techniques and fads. While the FDA considers tattoos cosmetics, it only gets involved with the industry after something unfortunate happens. But tighter regulation is always a possibility. As you research inks, take the time to see how the manufacturers are responding to changes in the industry, whether it’s something happening today or a prediction for the future. As more people get into tattoos, greater scrutiny of current practices will likely follow. It pays to stick with a manufacturer that is also paying attention to those winds of change. While inks are not regulated now, it could happen down the road. Those kinds of controls are difficult and costly to implement. Learn about the companies and their quality control procedures. You might also see tattoos created entirely with white ink. One of the main ways that white tattoo inks differ comes from what happens after the fact. Colors change over time. With white ink, it may turn an unexpected yellow or brown, depending on your skin tone. Other colors may fade, which is par for the course. White used with other colors will tame some of the distortions that can occur with using white on its own. White laid along the top of red rose will appear as a pinkish highlight because red is a stronger color. You may find some white tattoo inks that are heavier than other ones simply because of this use. Opaque colors may also have similar qualities. That’s why it’s essential to only use quality inks. 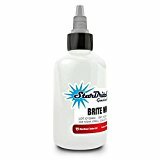 White tattoo inks also may catch your eye because of another application. You likely find some strong opinions out there about all-white tattoos. Some might view it as non-committal, saying if you want one, get a tattoo that’s visible. Let’s see your message. After all, over 40 percent of adults say that a tattoo with a meaning is the most important thing. There is some question about how an all-white tattoo will hold up for the long haul. Some have reported problems with discoloration especially after getting some time in the sun. Tattoos fade over time with sun exposure and other individual factors. White is no exception. Then, there’s the process of healing. Over time, your tattoo will lay down new skin that may cover a white tattoo or give it a disagreeable appearance like scar tissue. Your aftercare and subsequent sun exposure can affect its look down the road. If you set on getting one, you may find that some tattoo artists are reluctant to do these types of tattoos. If a client has a bad experience with one, they’re going to hear about it. The fact that it is permanent only rubs more salt into the wound. We've done all the hard work by laying out the top 5 white inks that you can spend your money on. If white inking is part of your tattooing setup, then you ​definitely want to be choosing one of the picks listed above. ​Now it's up to you to choose the ink that suits your style best and give those tattoos a nice outline!